blog.HalloweenAdventure.com | Latest News from the Costumes Trend FrontLines! 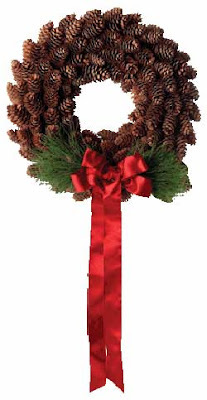 : Make your own: Pine cone wreaths! Make your own: Pine cone wreaths! Cut the wire coat hanger in half and form it into a circle. Wind the two ends together. I them secured the ends and covered the entire circle with duct tircle with duct tape. This held it together better and gave the pine cones a better surface to stick to! Once you have your circle formed, glue on the pine comes (a hot glue gun worked best for me). Decorate as desired. I added a ribbon and holly made out of crafting Foam. A added red beads for the holly berries.